The Plant City YMCA is offering an opportunity for everyone in the community —whether or not they are members of the Y — to spend some time playing and learning with their toddlers. 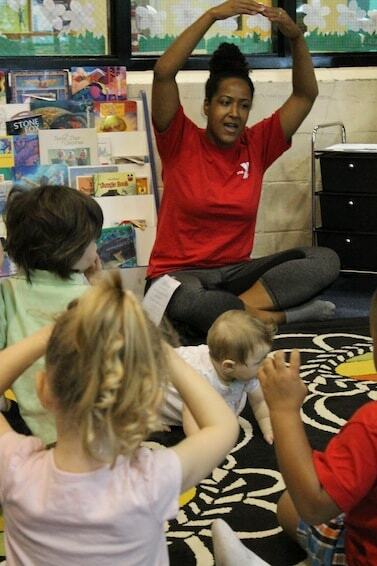 During the free program, called “Caring and Learning With Me,” children under age 5 are able to socialize, sing and use their senses, and are able to make benchmarks on age-appropriate development. “Caring and Learning With Me” used to be offered across town, at the Children’s Board of Hillsborough County’s house on U.S. 92. The program moved to the YMCA in mid-April, in hopes that more families would attend at this central location. When children arrive, they sit in a circle, where Vasquez leads them and their caregivers in a few songs and reminds everyone of the month’s theme. April’s theme was spring, so all of the activities were spring-related. After “circle time,” the children rotate through stations that emphasize different skills and subjects. At one of last week’s stations, children learned to identify different kinds of flowers. At another, they constructed a rabbit out of paper and yarn. There was also a math-related activity. Caregivers are encouraged to stay throughout the two-hour program and engage in each of the activities with their children. “We’re helping the parents or caregivers learn how to work with their children … both in the classroom setting, or in the home,” Vasquez said. Each session includes snack time, and on days with clear weather, there is usually a time of outdoor play. The stations change with each month’s theme, but children will go through the same stations for a few weeks at a time. It guarantees that they will have time to try out all of the activities and go back to their favorites, and it helps them lock in certain concepts. “Repetition is really important for children, and for caregivers as well,” Vasquez said. Children can attend “Caring and Learning With Me” twice a week, on a Monday/Wednesday or Tuesday/Thursday schedule. To register, call the YMCA at (813) 757-6677. To register: Stop by the YMCA or call (813) 757-6677.